Hello friends! I hope the spring is bringing you lots of sunshine. I am singing Tuesday evening 4/16 at Columbia University with my friends Lisa Daehlin and Tor Morton Kjosnes. The link with info is below and a flyer is attached. And some others including my original music from the new collection, Song Leaves, the poems of Walt Whitman. 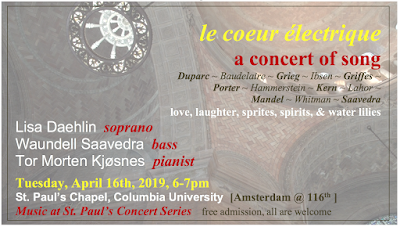 The recital is free admission and starts at 6 pm in St. Paul's Chapel at Amsterdam/116th St.